Warlord Games has a new plastic tank kit available over in their webshop. This one's the Cromwell Cruiser. 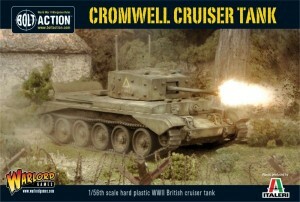 Our latest plastic Bolt Action tank is here and British armies will be pleased to receive the Cromwell Cruiser Tank! The Cromwell was the best of the Cruiser tank models, a type that was built to be fast and well gunned to take the war through the enemy line and dash forward to keep him on the run. Previous marks of Cruisers had proven to be either unreliable or poorly armed and armoured. The Cromwell was a good balance of firepower, armour and speed. Capable of 40mph, it was fast, and its armour was adequate for the period, if not well sloped. It carried a 75mm gun and two heavy Besa machine guns giving it the same firepower as the more numerous Shermans.